Taking a trip with your girlfriends is a great way to bond and have a wonderful time. 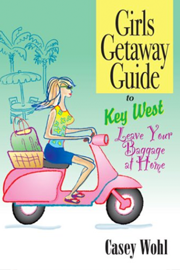 Author Casey Wohl has compiled the second in her ongoing series of girlfriend vacation guides, Girls Getaway Guide to Key West: Leave Your Baggage at Home. Full of invaluable information about this vibrant, colorful, unique island destination, the guide will ensure that you and your friends make the most of your travel time. Sports and outdoor activities, from parasailing, kayaking, snorkeling, and fishing to sunbathing yoga, Pilates, sunset cruises, wine tasting, and much more! Don't take your trip without this invaluable guide.